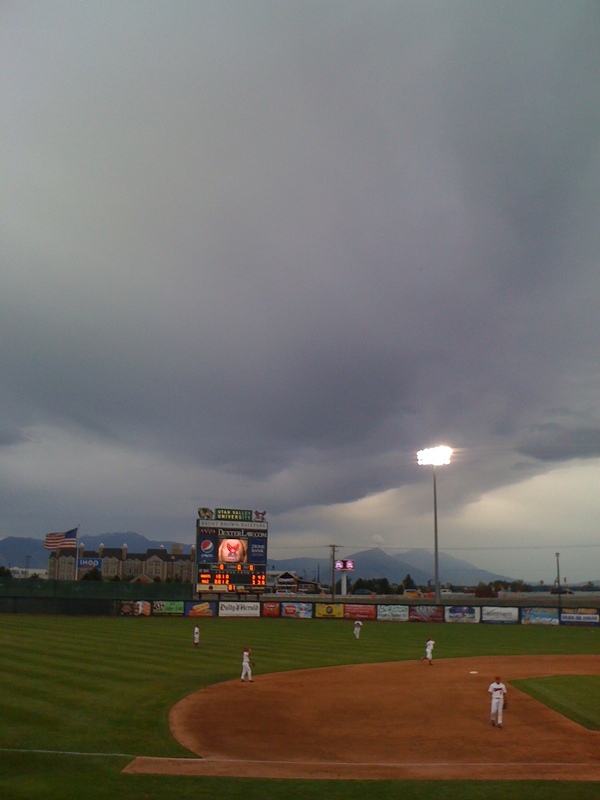 We spent our Labor Day evening at the local minor league baseball game. A few hours before the game the big boys helped their dad paint a door so they were wearing old paint clothes. When it was time to leave for the game neither of them wanted to change their clothes. I learned long ago that what they’re wearing is one battle I don’t fight. As long as they have clothes on I figure we’re good. So they went to the game in their paint clothes. Of course when you go to a sporting event you have to buy something to eat. I usually get something for the boys because it keeps them occupied and still for awhile while they’re eating. Tonight we all wanted a frozen lemonade so I set out with all three boys to find us one. The first concession stand was out of them. We almost bought some orange creamsicles instead but decided to check the other stand first. I really wanted a frozen lemonade. The other stand didn’t have any either. We were trying to figure out what to get instead when the girl who was working there asked if we wanted an ice-cream. I asked for two orange creamsicles so she went and got them. She took some time and I watched her digging through the box. I was worried that they were going to be out of those too and I’d have to change plans again. Once my boys have their mind set on something it can be hard to get them to change. She came back a few minutes later with two rather sad looking creamsicles. I tried to give her money for them and she refused it. I asked if she was sure and she said she was and mentioned how they looked. I gratefully put my money back in my bag and we brought our mangled, free, orange creamsicles back to our seats, stopping to get spoons on the way so we’d actually be able to eat them. As we were walking back to our seats, I looked at my boys in their paint clothes and smiled. Then it hit me that maybe the concession girl felt bad for me and gave me the popsicles for free because of the way my kids were dressed. I’m sure I looked tired and worn down because I was feeling that way. Maybe we looked like we could really use the $4 for something else. If that’s the case, I think I’ll have my kids dress like ragamuffins more often. I like free stuff. Sounds like a good strategy! Another bonus is that you really wouldn’t care what food they spill all over their clothes.